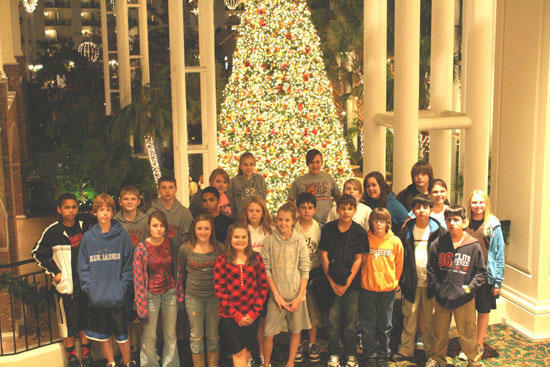 The West Side Beta Club attended the State Jr. Beta Club Convention November 23-24. They were very busy with academic competitions and entries in photography, wreath, jewelry, sculpture, sketching and scrapbooking. They also had an entry in the Living Literature competition. The theme for their entry this year was "The Borrowers" by Mary Norton. This is a children's fantasy novel about tiny people who "borrow" things from normal humans and keep their existence unknown. Katlynne Kellogg's wreath took 3rd place and the Living Literature entry took 2nd place! These entries will both be entered at the National Jr. Beta Convention in Louisville, Kentucky, June 26-29, 2010. Pictured: Back Row: Jonathon Mitchell, Walker Hatfield, Jacob Nave, Ryan Jordan, Tommy Mitchell, Katlynne Kellogg, Sarah Hickman, Elleana Sissom, Macy Clements, Mackenzie Cason, Joe Cawthorn, Emily Seng, Autumn King. Front Row: Madison Travis, Samantha Lehew, Brittany McCoy, Sydney Elrod, Katie Hickman, Jake Burdick, Sam Sissom, Brady Page, Kyle Margarito, Kody Margarito.